We also stock new Etnyre parts. (Click here). (Click here for a full listing of NEW Marathon Equipment). 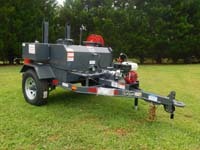 New Marathon TPS115S tack distributor, skid mount, Honda 5.5hp gas engine, 10GPM pumping system, 115 gallon capacity, 5 ft spray wand w/50ft hose, 10" filler lid, hose reel, 80,000 BTU propane burner, flushing system. JFW Equipment has long been a major source for paving professionals looking for a quality used, rebuilt or refurbished Asphalt Distributor. We purchase and repair asphalt distributors of all types. We feature one of the largest and best inventories online anywhere. And we are always purchasing and repairing asphalt distributors so be sure to bookmark our page to see our latest offerings. 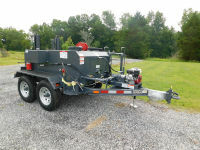 JFW Equipment is THE trusted source for many paving professionals when seeking a rebuilt or refurbished Asphalt Distributor, and has been 30 years. We ship worldwide. Contact us. We can help you find the right asphalt distributor at the right price. We frequently feature a wide range of Asphalt Distributors , from large tank Etynre distributors to smaller, trailer-mounted versions. You can rely on JFW Equipment to choose the best used asphalt paving equipment available and then inspect, repair and revitialize each asphalt distributor we sell. We also have asphalt distributors that we are currently rebuilding, which are not shown on this site. So if you have a particular used asphalt distributor in mind, don't hesitate to contact us. We are well known among buyers and sellers world-wide. And we always do our best to help. JFW Equipment has years of experience in rebuilding asphalt distributors. Our long-standing commitment to Asphalt Paving Equipment is built on constant communication with the paving industry. Email JFW Equipment here or call (866) 685-4998. We can help. Find out about our newest offerings as soon as they are available! Click above, then like, follow or watch our equipment videos. copyright 2018 JFW Equipment Inc.